The wooden chess table is suitable for outdoor decoration, especially in your garden and patio. Although it is made of wood, it is fine to combine it with steel chairs. It delivers the look of vintage and modern. Chess table so perfect for use as furniture in your house. You can use it in your living room, dinning room or even yoour patio area. it would be so nice if you decor your patio with such kind of chess table, so you can play chess with yur partner there. Very sophisticated! You can find different atmosphere then usual by ask your partner to move the chess board and pieces to garden, backyard or patio area. 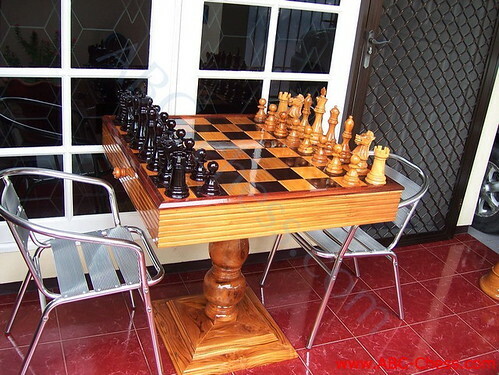 We provide chess set for outdoor use that has made from Teak wood. So its durable for outdoor game and durable for any weathers. Carved by expert craftsman and polished well in beautiful color. Get it now!